As I listened to the wonderful podcast of The Splendid Table (free from iTunes!) I was by turns grateful (that I hadn’t been swindled out of USD$156,000 for a bottle of “Thomas Jefferson’s wine”), intrigued (to try a new gazpacho recipe and new blender: the Vitamix) and surprised. It was during a segment on baking desserts, a segment to which I was only half-listening as I don’t bake very well. The woman was going on about her Greek grandmother (ah! My ears perked up a bit) and how she smelled of Orange Flower Water. She used it in her desserts and daubed a bit behind the ears. “Hey! I’ve got a bottle of that stuff lying around,” I thought. Orange flower water is the left over liquid from the distillation of bitter orange blossoms. (The distillate, an essential oil, is called neroli and is used in perfumes.) Orange flower water is sometimes referred to as an “essential water” and is frequently used in Middle Eastern cooking. It also holds up well. My bottle is from Crabtree & Evelyn, which doesn’t seem to carry it anymore. It must be at least ten years old. It also turns out that it makes a delicious glass of sweetened mint tea that much better! Thanks Splendid Table! Give it a try. Highly recommended. This entry was posted in Entertaining, Living and tagged green tea, orange flower water, Ramos Fizz, recipes, Sazerac. Bookmark the permalink. I just can’t listen to Splendid Table… it’s sounds like bad 70’s public radio. And I LOVE NPR! I have a bottle (C&E), too. I think I may have rose flower water as well. I got them because it seemed so sophisticated to see them on the shelf. And I am was (am?) a sucker for blue bottles. Rose water is another wonderful ingredient for cooking or drink-mixing. I’ve heard of using orange flower water for cooking before, but I always assumed it was difficult to obtain (which your post seems to support). But you’ve definitely opened my eyes to this so if I ever find some, I’ll send it your way! I have some lovely liquid soap and lotion made with neroli oil and grapefruit given to me – the label is REN and I adore the simple and fresh fragrance. Here’s to all the eau de fleurs! Thanks for the tip. I adore citrus. You’ve convinced me I need to order a bottle. Like Aesthete’s Lament I’ve been using rose water for some time, usually in a version of Backlava but also in simple sugar cookies. 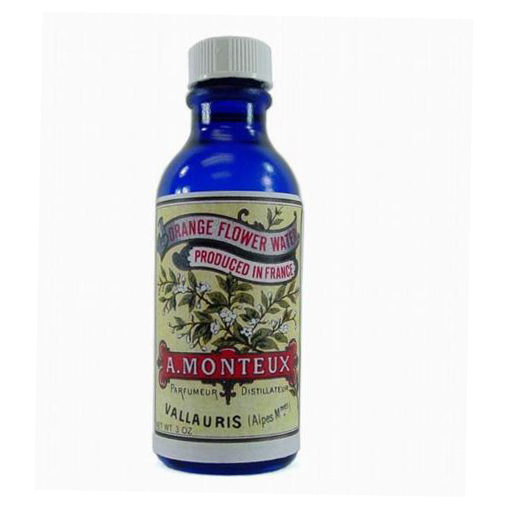 I found a bottle reasonably priced at: http://www.thespicehouse.com/spices/orange-flower-water?gclid=CK_t086F4ZUCFSJIagodM29RWg, I’ll let you know about quality once it arrives. Hope you get a VitaMix. I have one and LOVE it. They are all made here in Ohio by real people. I know…because I met them all. Plus, you can have it much longer than your C&E Orange Water and they’ll repair it if ever needed. Hello Robin, may I ask which model you have and what you use it for the most? A drop in mint tea sounds lovely! Although am rather enamoured by the idea of dabbing behind the ears as well — would be rather nice to smell of orange blossoms. Hope you’re having a brilliant week so far. I have the Vita-Mix Super 500. I use it for soups, salsas and sorbets. It came with another “dry” container which I have used for making my own bread crumbs but could use it for actual bread making. I host a daily television show in which we do cooking segments 3-5 times a week. I can’t believe how many of our local chefs drag in their Vita-Mix. Quality product indeed. Oops…that’s Super 5000. My right ring finger must have failed me!